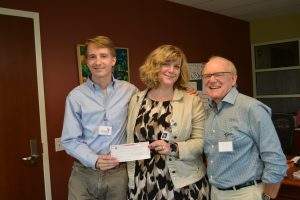 Jan Gierlach, left, and Bob Lee present a Ride for Three Reasons donation of more than $165,000 to JourneyCare President and CEO Sarah Bealles. Jan Gierlach was just a small third-grader when he was captivated by a big idea. Ride for 3 Reasons founder Bob Lee spoke to Jan’s class about his adventures biking cross country in support of cancer research, hospice and advance care planning education, and ALS research. Almost a decade later, Jan acted on those words. Now age 17, Jan and his parents reached out to Bob for advice in planning his own ride and Bob quickly convinced Jan to become the next generation of the Ride for 3 Reasons. Last April, Jan completed a three month, 3,300 mile, solo bike ride across the southern tier of the United States, from San Diego to St. Augustine, Fla., raising over $620,000. Jan chose JourneyCare as a beneficiary (where his mom, Doris, and labradoodle, Otis, are active pet therapy volunteers), presenting the agency with a check for more than $165,000. JourneyCare will use the funds to enhance the agency’s community education outreach for advance care planning and end-of-life care, including the launch of an annual symposium focused on these issues. 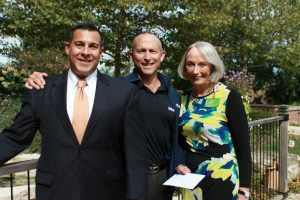 AdvaCare CEO Larry Feldman, center, presents a donation of more than $15,000 to JourneyCare Foundation President Joseph Matty and Senior Philanthropy Director Anne Rossiter. This year, a longtime tradition took a new twist. 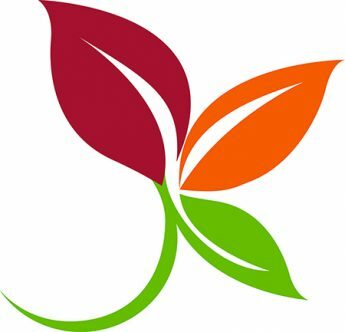 JourneyCare and AdvaCare Systems have shared a years-long partnership in helping patients and their families, with AdvaCare sponsoring special events JourneyCare holds throughout the year. But this summer AdvaCare CEO Larry Feldman collaborated with his best friend, Blitt and Gaines CEO Fred Blitt, to create a new charity golf outing held by their companies. Their friends and partners would tee off to benefit a cause important to Fred, Recovering Communities of Step Ahead, as well as Larry’s dearest cause … JourneyCare. Their new event proved a success and raised more than $15,000 to benefit JourneyCare programs. “We are so grateful to our most supportive business partner, AdvaCare, and they have provided a wonderful service to our patients and their families,” Senior Director of Philanthropy Anne Rossiter said.